This month’s cover story reflects an issue that’s hitting the headlines – the increase in addiction to gaming, which extends to online gambling and all its compulsive cousins. According to author Peter Smith, we are well placed to take a proactive role in treatment and provide all-important family support. It’s a tricky issue that defies neat categorisation. When does a hobby become an obsession? It’s an unenviable task for parents trying to detect and deal with a problem, but hopefully the article will give some useful pointers on support. 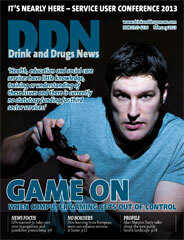 There are contributions in this issue that demonstrate why DDN will always strive to be an open forum for debate. In our Soapbox, Dr Eliot Albers eloquently makes the case for preserving respect and dignity alongside harm reduction, and highlights stigma created by an abstinence-focused recovery wave. While on page 14, Marie, as she nears the end of her ‘journey of self-discovery’ series, credits colleagues and activists in recovery with reaching out to her and helping her to retrieve her life. The views are very different, but the common bond of individual rights is a timely reminder that mutual respect should be sacred. We’re looking forward to seeing you at our Be the Change service user involvement conference this month. We’ve got groups coming from all over the country – click here to book your place, it’s not too late!